I just saw this today, January 12, 2015, posted on my facebook newsfeed. Oddly enough, I was just preparing a post for my blog for tomorrow about my goof-up with making rice in the crock pot. I used brown rice. It was about 1 1/2 cups of rice and if I remember correctly, I put nearly 4 cups of water in my little 1 1./2 qt crock pot on low. The problem is that when we got home (5 1/2 hours later) the rice was all sticky. I read a recipe recently where the blogger made a chicken and rice recipe in her crock pot but when she used brown rice it got too sticky; she fixed it by using instant brown rice. I have to tell you mine was like mush. Michele, I think you probably just cookied it too long. 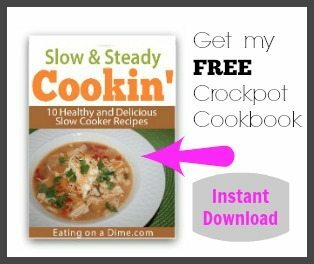 I would cook it when you are at home (like on the weekend) so you can get an idea of how long it takes your crock pot to cook it. Then from that day on you will know what a good amount of time is. I cook 4 cups of rice (or more) for any meal I need rice in and I always do it on the stove top. In fact, mostly my 11 year old cooks the rice. She sometimes even makes rice for breakfast before I am even out of bed. I see nothing about cooking it in the crock pot that actually saves time or effort. For white rice you bring 2 cups of water per 1 cup of rice in a pan and bring it to boil. Then you pour in your rice, turn onto low, set a timer for 20 minutes, and walk away until the timer goes off. Brown rice is the same except the time is 40 minutes like you mentioned above. In my head cooking rice for 20 minutes or even 40 minutes saves more time than 3 hours. You can still divide and freeze the rice and you saved 2 hours or more of time. I am sorry, I suppose I shouldn’t have made my comment. You may delete if you wish. I wrote it with the thought of helping you actually conserve time but that is not the way it appears. It was not meant as an attack of your idea or way of doing things. I do apologize if it came across that way. The internet is so full of people being negative and attacking people and I don’t want to be one of them. This is probably a really dumb question but how do you reheat your rice without it drying out? There is no dumb question here Basia :). Ours doesn’t really dry out, but if it does, add in two to 3 tablespoons of water before you reheat it. Or we have even added a few tablespoons of butter. This did not work for me at all…..it went from watery and not cooked to gummy and disgusting. Oh man. That happened once for me. I think it was cooked too long. When I shortened the cook time it worked much better. No stupid questions here -no we are talking about the bagged rice – not the minute rice. It is much cheaper in the bags. I’m going to try this method since I can’t cook it correctly on the stove & believe it or not it doesn’t turn out well in my rice cooker. I’m supposed to eat brown rice & my husband would be happy if he never had to eat any rice again. Not sure what everyone is talking about. I followed this recipe to to the letter and my rice came out fab! Thanks!